An Interview with Irene Natividad, President of the Global Summit of Women. "If you are not passionate and love what you do, you can't lead and ride the waves of change." President of the Global Summit of Women, an annual international gathering of women leaders from around the world, and co-chair person of Corporate Women Directors International, which promotes the increased participation of women on corporate boards globally. President of the public affairs firm, GlobeWomen, based in Washington, D.C. her commitment to promoting women, nationally and internationally, stems from her decade-long involvement with the National Women's Political Caucus, a 30-year-old bipartisan organization dedicated to electing and appointing more women to public office. "I was gifted with a voice to help people create change for themselves and women as a whole." 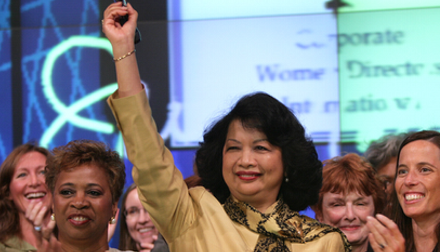 She was elected President in 1985 and re-elected in 1987 -the first Asian American ever to head a national political organization. During the nineties, she assumed the chairmanship of the National Commission on Working Women, which works on economy equity issues affecting women through groundbreaking research and training programs. Her commitment to women's economic empowerment has extended to the global arena, where she has provided a forum through the Global Summit of Women to exchange best practices in accelerating women's economic progress. I am lucky to have had 3 political mothers, 3 congresswomen who mentored me. It was a real honor for me that they did that. The first, Bella Abzug, was the voice for women's NGOs at the UN. If NGO's have had any impact there today, it is truly because of her. The second was Shirley Chisholm, who was the first African-American Woman Member of Congress. It was she who nominated me for President of the National Women's Political Caucus, a 30-year-old American bipartisan organization dedicated to electing and appointing more women to public office. She is a real icon to me. And last but not least, Patsy Mink from Hawaïi, who was the first Woman-of-Color Member of Congress in the US. She helped draft an education legislation known by its number -- Title IX -- that led to the funding of sports in school for women, an unintended consequence resulting in Olympic medals for US women athletes. In my opinion, there is no equivalent to them today in the U.S. They were all great members of congress, who were also great women Leaders who fought for change for other women. "Leadership takes courage, to have a vision and make it happen. With role models like that and hard work, how can I do anything less?" I am passionate about what I do and work very hard to achieve my goals. I can envision change and know the details that need to get done to get us there - so I am both a worker and an 'envisioner'. Both traits are necessary if you are an activist and advocate. It's not enough to dream, you need to get things done. I'm known for being tough and am no 'shrinking violet' (laughter). I was gifted with a voice to help people create change for themselves and women as a whole. Being elected President of the National Women's Political Caucus. This made frontpage news, as I am the first Asian-American Woman to become the President. Asian-Americans, in general, are known for being smart and for being hard workers, but not necessarily as leaders. I helped to break that stereotype. My election as head of this Caucus forced me to move from my secure academic life in New York, to a less secure life of insecurity leading a non-profit in Washington, but which offered a bigger stage for the work I wanted to do on behalf of women. The other key highlight of my career is the birth of my son. There is no equivalent to that. I was a hardworking woman, but life did not seem complete until I had my son. He arrived later in my life and really changed it. Children are demanding and they make you forget work's challenges as soon as you walk through the door. It's not easy keeping them entertained! They bring out in you such humility. I salute working mothers and am proud of them. For example, the CEO of GE France, a speaker at the Summit in Berlin, has 9 children - 5 of her own and 4 from her partner. She broke the perception that only single women could be CEOs, since they would be less distracted by family responsibilities. Working mothers are incredible, no matter what job they hold. When things go bad, they often figure out a way to get around them. "Being a mother is one of the roles I am most proud of." I find that women have a more horizontal style of leadership. They are more careful to ensure they get opinions from other people and go really down to all the details. I have a global network of people I turn to to get help and information, you can't possibly know everything! We are the ultimate multi-taskers because we have to be. Imagine a woman with a child on one hip, while she is cooking a meal, managing another child's homework and taking a phone call! That is an apt metaphor for the juggling roles women play. Men on the other hand, have a much more vertical style of leadership. They are more definite and as they don't have to multi-task as much as women do. As a result they get more focused on specific tasks. Men are perceived to be more decisive, although I have known some men who have a hard time making decisions. "To many women I often say, be yourself, ask others for advice and your decisions can only be better for it." What kind of Corporate culture does the Summit help to create & support? I try to showcase companies at the Summit that enable all employees to combine and integrate their work and family responsibilities. The fact is that today, men want this balance as well. One accounting firm I know made changes to their policy to create more work-life balance and it impacted the bottom line. Men also valued the flexibility and the fact that women and men could also be considered for promotion even if they did not work on a full-time schedule. These types of changes are great, since they help women to avoid career gaps that have negative impact in the long term. These types of changes in the work culture benefit everyone. In Sweden, they are taking the lead on this with legislation that requires men to take 2 months paternity leave when their child is born. If they don't take it then the government taxes them! In the past there was a stigma attached to women and men who took parental leave and now that has changed. As a result of these changes, the Swedish government has also noted a decrease in the number of divorces, and an increase in wages for women because they no longer have to take a full year off work to look after their child. This legislation has also opened up women to taking leadership roles as they have a continuum in their careers vs the gap they had in their careers before, due to childrearing. At the Summit, we feature best leadership practices that make people stop and think. For example the discussion at the Athens summit - a forum with men and women CEOs - about the importance of having quotas. The men ended up being strong supporters of this legislative mandate to increase the number of women on corporate boards. We need their voices on this issue, because quotas are important initiatives that give women an equal voice in the corporate board room..
Not only do we want to help create a different work culture through the Summit, but we also want participants to understand clearly what the 'global economy' means through the women they meet there from 70-90 countries yearly. I also want women to be 'literate' on key economic issues affecting people globally. We have about 85 speakers at each Summit, and I work hard to make sure that each panel is geographically balanced as well as diverse in perspectives on a particular topic. "No one area of the world has the magic answers, but we can help each other along if we find out what one woman did in her country to address a particular problem, whether she is a Minister, a corporate executive, an entrepreneur or an NGO leader." At the recent Summit, someone commented that no one group looks down at another - all are on a level playing field. I love the way that even in the breakout sessions, the level of the speakers is amazing and you can meet CEO's in the hallways. How do you help grow leaders in your company? Our organization is the Global Summit. Through the Summit, we showcase other global role models, so people on our team get access to fantastic leadership role models. They get to learn about the key tools of leadership and best practices in other places that they may not have thought about. This knowledge-sharing is not quantifiable, it gives us all an inspiration to be better and bigger because we get to see what is really possible as a true leader, not theoretically, but in reality, through those that they meet at the Summit. Work is the center of my world and creating this global forum and making it sustainable is my biggest achievement. It's easier to start something but much harder to make it grow and thrive. The Global Summit has been going strong for 25 years and it now has a very strong reputation, so much so that countries now bid to bring the Summit to their shores! Because it has grown, it's always a challenge to stay relevant and bring in new leaders to showcase and learn about how they do things. We work very hard to build a great program and also to do research in between Summits. We are proud of the research we have done on Women on Corporate Boards. At the Summit in Athens, we released our 19th report in 16 years, which is not easy to do. At the moment we are doing research on Latin America, where we look at the 100 largest companies there to see where women are in their corporate boardrooms. I will be spoke at the Global Economic Symposium in Rio, and we released the report there. It's important for us to add knowledge on where women need to be in the coming years. I did a doctorate in American literature and many people say I didn't need to given the political and advocacy work that occupied most of my adult life. I believe everything you do adds to you, nothing is wasted. My academic work taught me how to articulate and convey ideas, which are very important skills when I became an advocate for women and people of color, in general. I believe you should never look back. "Women's careers are not a direct line to achievement. Instead, careers go up and down, with their highs and lows. If you are not passionate about what you do, you cannot get through the lows. Don't be a backseat driver in your life! Keep looking forward." My life has been and continues to be all about giving back to Society, particularly to women. I continue to give back and feel it's very important to do so. There are still many parts of the world where we have yet to reach women. Latin America is vast and we still need to go back there again - this year the summit is hosted by Brazil (we have also had the Summit hosted by Chile, Mexico, Argentina). We have not been to many countries in Africa (outside of South Africa, Morocco and Egypt) yet, and there are still women who need to be touched and connected as part of a global network of women. I hope my health continues to be good so that I can make this global forum available to more parts of the world. It takes persistence and commitment -- it's not like a dress you can just take off and put on the bed. Europe is making a lot of changes with regards to quotas and I'm very proud of it. Over the next decade, the face of corporate leadership will change in Europe, and women will filter down to senior management, where they don't exist yet. That's why in the reports we have issued on women corporate directors globally, we talk about how effective quotas have been. In France, for example, they passed a quota that requires 40% of board seats must be held by women and half of that percentage must be reached by 2013. Well, in 2012, they were already halfway there at 20.4%. "You gave me the numbers about quotas and women on boards in Europe, I brought them to my Prime Minister to share good practices. It made me very energized and as a result, the Malaysian Prime Minister has installed 30% quota of women on boards! This is amazing as Malaysia is the first Asian and the first Muslim country to do this."